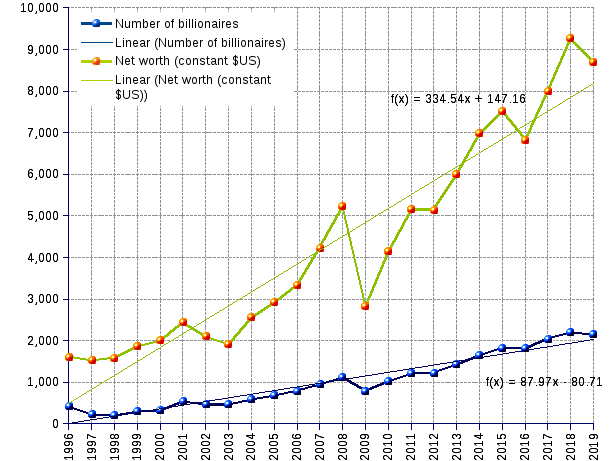 The share of wealth grabbed by the super-rich is staggering. From constant US$1.6 trillion in 1996, it climbed to 8.7 in 2019. Billionaires make just 0.00003 percent of the world population, but they currently own the equivalent of 12 percent of the GWP (gross world product). Nothing seems able to stop them. Their number has gone on and up, from 423 in 1996 to 2,153 in 2019 (average growth rate of 7.3% — only 1.2% for the world population). Their assets have grown with a similar unrelenting momentum (7.6% average annual growth, against 2.5% for GWP, both in constant dollars). In plain terms, the good ordinary people are letting go a growing portion of their share of the wealth to please the ultra-rich and render them richer. Crises may hit the planet, but billionaires hardly sneeze, while the rest of mankind struggle with economic suffocation. In the last seventeen years, their aggregate assets suffered only three slumps, a harsh one in 2008, and two comparatively minor ones in 2016 and in 2019. Quite an amazing show. Ethical considerations aside, we may wonder whether such a chasm between the subset of ultra-rich and the vaster community of common men is a triviality, nay an odd but nevertheless mundane phenomenon. The emergence of a ponderous and fast bulging entity is often a symptom of some disorder. In natural ecology, the presence of a thriving predator ruins the balance of the milieu, causes the extinction of the prey species, and leads ultimately to the downfall of the predator itself. In physiology, cancers feature an abnormal growth of certain cells that spread to other parts of the body and unmercifully destroy the host organism. In astronomy, black holes can grow further by absorbing mass from its surroundings, including other stars and black holes, and evolve into super massive black holes. In urban sociology, the sprawling of a great city into a thickly populated megalopolis, such as Lagos 21 million inhabitants, Dhaka 20 million or Mexico City 21 million, entails a dramatic deterioration of life conditions, the disruption of the ecological environment, the massive immigration of rural populations, rising unemployment, the surge of insecurity and crime, the debasement of public services and the decay of public health, and the eventual collapse of the social fabric. In social history, empires grow and expand territorially by successfully assailing and overpowering the neighbors, only to stretch their reach beyond their actual power to keep the variety of ethnic groups, geographies, factional interests, cultures, customs, and crafts under the same roof — thus faded the Persian, Roman, Muslim Caliphate, Mongol, Seljuk, Ottoman, British and a number of other once flourishing empires. Growth must come to a stop at some point in time. An infant grows to a toddler, to a child, to an adolescent, to an adult. He may develop to become 2 meter tall, and 100 kg heavy. But nature sets limits that prevent him from ever being 5 meter tall or 500 kg heavy. Standard economists, nevertheless, are so engrossed with their arithmomaniac, linear schemas that they gleefully devise everlasting growth (and yet sustainable , they claim) models, earnestly declaiming that ultra-rich are a blessing. As the rich get richer, they contend, the more wealth trickles down to the gratified poor. In their minds, the discipline of economics is exempt from the laws that rule growth and change in the other science realms. Ancient Greek mythology contains an ominous warning against greed. Tantalus was extremely rich, favored by the gods, sitting at their table. His extravagant good luck made him behave eerily, committing many wrongdoings such as stealing ambrosia and nectar from the gods, demanding eternal life from Zeus, refusing to give back the gold dog claimed by Hermes, and, the worst of all, sacrificing his own son Pelops, cutting him into pieces, cooking him and serving him up in a banquet to ingratiate the gods. It was one offense too many. The infuriated Zeus sentenced him to suffer from unquenchable thirst and unappeasable hunger, with fruits hanging above his head and freshwater flowing under his chin but out of reach for all eternity. Temptation without satisfaction. Today billionaires' behavior is as callous and relentless as the mythological creature's. They do not care much for the armies of wage workers who toil to earn a living. They have their minds set on improving the share value of their enterprises. For this purpose, they split work schedules into pieces, substituting precarious jobs, part-time assignments and moonlighting to regular and steady employment, however modest. They compress workers' remunerations as close as possible to the subsistence level, while wrapping people in a haze of marketing-induced wants. Common people cannot afford to buy the goods? No problem, financiers design debt instruments that will provide the feeling of ownership at the price of unending slavery. Former slaves were costly: the master had to supply, not only the whip, but also shelter and food. Modern slaves cost nothing, they do the enslaving all by themselves. Contrary to the frustrated Tantalus, modern billionaires can have it all. They relish the rapture of stockpiling interests and capital gains. They enjoy the refinements of unique lifestyles. They indulge their craving for self-aggrandizing demonstrations of a generous heart. They can even cook and devour their son Pelops , so to speak, in all impunity — earth resources are massively depleted and mountains of waste pile up to make them wealthier. And the gods, what the heck do they do? Well, they just look at the show with torpidness, and they do not budge the little finger of their alleged invisible hand. Unlike Greek gods, modern ones are disinclined to mess with human affairs. The 2008 global financial debacle prompted many rationalizations about the end of speculative finance, unruly capitalism, privatization of gains and nationalization of losses, and unbridled inequality. The old, wild financial capitalism seemed doomed. Eleven years later, it is still alive and well — if anything, it never fared so well! Short of an unexpected shift, nothing seems to threaten its irresistible ascent. Until Zeus awakes and decides that enough is enough. ¹ Adjusted by applying the $US GDP deflator index for the previous year. ² Could not access Forbes data required for the computation of the median for 2019. Source: Forbes List of billionaires.